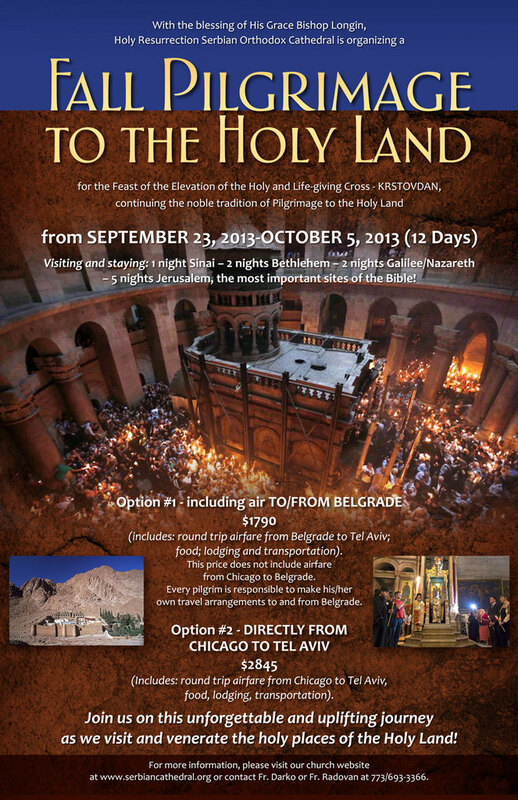 Chicago, IL - Holy Resurrection Serbian Orthodox Cathedral in Chicago is organizing a second pilgrimage to the Holy Land this year, set to coincide with the festal celebration of the Elevation of the Holy and Life-giving Cross at the Church of the Holy Sepulchre in Jerusalem, continuing the tradition of Holy Land pilgrimage revived by this month’s Paschal trip by Cathedral parishioners. The 12-day Krstovdan Pilgrimage, from September 23rd – October 5th, 2013 will be led by Cathedral clergy with the blessings of His Grace Bishop Longin. “As Abbot Metodije of Hilandar monastery noted when he visited our Cathedral, many times people come to Mount Athos as tourists and leave as pilgrims. The change from tourist to pilgrim is a profound one. The tourist is a modern invention; he seeks otherness with a cosmopolitan gaze but remains unchanged. Pilgrim is a medieval phenomenon, and its motivation is self-transformation, humbleness in the presence of holy sites, repentance and forgiveness of sins,” explained Fr. Darko Spasojevic, Cathedral Dean. “Pilgrimage is also a social event, the more pilgrims the holier the pilgrimage. With tourists it is exactly the opposite, the presence of other tourists might detract them from authenticity of the specific place and experience. So, pilgrimages have a profound impact on our spiritual formation, not to mention the deepening of our knowledge and the first-hand experience of the holy sites,” Fr. Darko added. During the course of the 12-day pilgrimage, participants will have the opportunity to see and pray at the most significant sites of the Bible – particularly the sites where our Lord and Savior Jesus Christ ministered, worked miracles, suffered and resurrected. The trip will also include a visit to the holy sites at Mount Sinai. The feast of the Elevation of the Holy Cross, a major holiday of the Eastern Orthodox Church which commemorates the elevation of the True Cross by Saint Empress Helena at the dedication of the Church of the Holy Sepulchre in 326 AD, is celebrated with particular solemnity by the Jerusalem Patriarchate which is the guardian of the site where the actual event had occurred. For more information, please contact Fr. Darko at (773) 693 – 3366 or via email at frdarko@gmail.com.